I’ve known how to make bread for a long time. It’s effort. Like all day effort and hard on the arms. Especially when you have to stand on a stool to knead effectively anyway. So. We love fresh bread. When we went to Montreal, there was a bakery every few blocks so we had baguette. (and cheese, because it was everywhere – even gas stations. Viva Quebec! *ahem*) After we got home, Ron got to hinting at me to see if I could make baguettes. The lovely Margaret Roach even sent me her unused and languishing baguette pan. I googled for recipes, I adjusted, I followed tips. Then one day on twitter, I saw a company having a contest where the winner got a preview copy of this new cookbook. Ironically, I won because of my flaming loaves of bread story. And in 140 characters, no less. In the cookbook was a recipe for artisan bread, adapted from that artisinal bread cookbook everyone raved about but I failed at making properly. And? With my own further adjustments? We have bread perfection. Pop the water in the microwave for 30 seconds. That usually makes it lukewarm. You want it warm, like baby bathwater warm. Put the yeast in the water. I have a big steel bowl I mix this all up in. Measure out the flour in another large container or huge glass measuring cup. Mix the salt in with the flour NOT the water. This amount of salt causes the yeast to grow slower than usual and adding it to the water with the yeast will hurt it. Dump the flour/salt in the bowl with the water/yeast and mix it. I have a sturdy wooden spoon. Keep stirring. Or not, depending on if you are tired. The dough will be really sticky and quite a mess. It you don’t stir it much, the flour will soak in anyway, especially if you are going to leave it. Now you can cover all the dough up and toss it in the fridge to use whenever you want. It will keep. It will also not rise & fall (remember the salt?). The flavor will also mellow. Or, you can use all the dough now and make 4 loaves. Or, cut off half the dough. Either way, let the dough site for a couple hours. Or so. It should look like it rose, but don’t angst about how much unless your house is really cold. You can’t leave it so long it will fall, unless you completely leave it out all day. Divide the dough in 4 if you used all of it, or two if you hacked off half a chunk. 😀 Resist the urge to knead it, tho you can lightly oil or flour it. If you left the dough in the fridge, you start here. 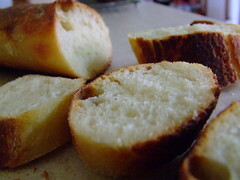 Stretch out a bit of dough in the baguette pan or on a stoneware pan. Or dump it on a stoneware pan so it’s round. Or oval. Or whatever floats your boat. In a regular loaf pan, it is disappointing. Pretend you are a farm wife and you can’t afford a loaf pan but your love (and bread) makes you happy. 😛 If you use a nice fancy metal baguette pan with tiny holes in it, line it with parchment paper. Letting it rise in the pan without it will make it really hard to slide the cooked loaf out of all those teeny little holes. Come back in an hour and a half. It should look puffy and you will see air bubbles under the surface. Put the stove on the preheat at 450. If your oven runs hot, 425 will do. Go away for 15 minutes. Come back and toss the pan with the dough on it in the oven for 25 minutes. If you want to get really fancy and do the crusty crust thing, when the oven is preheating put a cookie sheet on the bottom rack and boil some water, about a cup or so. When the over is preheated, place the dough & pan on the middle rack, and just when you close the door, pour the boiling water on the pan on the bottom rack and quickly close the door. This will make a crunchy crust. But this one time? Like, last week? There was oil on the bottom pan and the water rushing onto it made it WHOOSH up and the parchment paper lining the top pan caught on fire. And then your husband will give you That Look and sigh and you’ll be all, “WHAT? THe loaves themselves are not burning and.. look, see? The edges of the paper are all done burning now,” and when they are cooked he will only gently shake his head at you when brushing soot off the finished (and PERFECT!) loaves. So there. Have butter ready. Resist the urge to slice it right away as it’s difficult and kinda hot. These go stale after a couple days, but it’s so easy to toss some dough in a pan and have the rest waiting in the fridge, why the heck not? 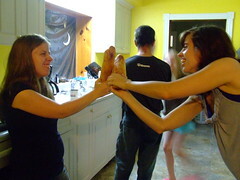 Baguette fights may break out if you make two at once.